This Order was founded on 18 th February, 1831, by Grand Duke Leopold, as a public acknowledgment for long and loyal service in the army. 1. 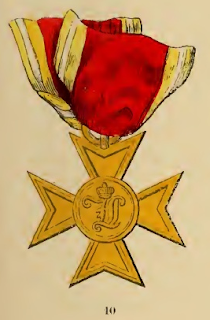 Officers who have served in the line twenty-five years (including the years of lower rank) receive the small golden Cross (No. 10). 2. Privates and sub-officers receive a buckle with a red ribbon, of yellow stripes, and white borders. It has three classes : for twelve, eighteen, and twenty-five years service; the respective buckles (Nos. 5, 6 and 7) are of iron (mounted in silver), silver or gilt. The Cross is worn by the officers at the button-hole, suspended by the same ribbon as above while the buckles of the other classes are worn on the left side of the breast. Since the foundation of these latter badges of distinction, the "Military Order and Medal of Charles Frederick" were discontinued to be conferred for service of twenty-five years, and the claim thereto is now confined to its original destination : viz. to "valour in war".